You might already know about the Discovery Series at the Paramount Theatre, a season full of family-friendly shows that expose young people and their families to high-quality productions at our historic theatre. What you may not know is that the Discovery Series is only one small piece of the puzzle, where these shows are concerned. Each month, the Paramount hosts theatre groups and their work from around the world. In addition to performing publicly, they also perform multiple times for an audience of students and their teachers as part of our Student Matinee Series. These shows are aligned with curriculum standards and are seen as an extension of the classroom! Prior to attending these field trips, many classes take part in pre-show workshops. 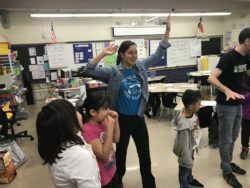 In these workshops, a professional teaching artist from the Paramount Academy for the Arts will spend 45 minutes in each classroom, exposing students to themes presented in the play and theatre etiquette skills. When the day of their field-trip finally arrives, students enter the space in awe of its restored beauty. Without even realizing it, they are experiencing a huge part of our city’s history! As the lights fade and the puppets light up, all sit in complete and total awe of the breathtaking production. Once the show comes to a close and the students are released back to their buses, teachers are equipped with study guides to distribute to the students. 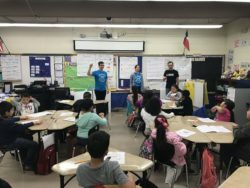 These guides ensure that students are bringing the theatre back into their own homes by asking them to answer questions about the production and partake in activities that align with what they are learning in school. These students are experiencing the theatre from all angles, from the implementation of the show’s themes in the classroom, to the actual experience on a 101-year old stage, all the way back to the conversations had at home about their perception of the show. Over 4,000 students and teachers will have the opportunity to see this production come February. 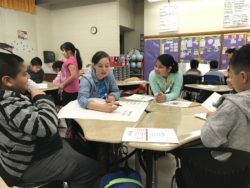 About 30% of those classes will receive pre-show workshops on their campuses, and more than half of the schools attending this show are of title-1 status. We at the Paramount strive to provide access to the arts for ALL, and this is just one way that we ensure theatrical discovery for our community’s youth. Currently, we’re gearing up for the final installment in our family-friendly Discovery Series, Love That Dog! Just in time for National Poetry Month, this heartwarming tale of Jack. Jack hates poetry. Only girls write it and every time he tries to, his brain feels empty. But his teacher, Ms. Stretchberry, won’t stop giving her class poetry assignments – and Jack can’t avoid them. But then something amazing happens. The more he writes, the more he learns he does have something to say. We’re thrilled to be bringing this top-notch piece of theatre to Austin, and encourage you to join in on the fun! Don’t miss your family’s chance to see the fantastic production of Love That Dog at the Paramount Theatre on Sunday, April 9th at 3:00 p.m!